In this article, We will learn what does range function do in python and how to use python range() function. range() is a built-in function of python. The range() function generates the integer numbers between the given start integer to the stop integer, which is generally used to iterate over with for Loop. Python range() accepts an integer and returns a range object, which is nothing but a sequence of integers. Let’s understand how to use range() function with the help of simple examples. In the output, we got integers from 0 to 5. range() function doesn’t include the last number in the result. The most common use of range() function in python is to iterate sequence type (List, string etc ) with for and while loop. Out of the three 2 arguments are optional. I.e., Start and Step are the optional arguments. A start argument is a starting number of the sequence. i.e., lower limit. By default, it starts with 0 if not specified. A stop argument is an upper limit. i.e.generate numbers up to this number, The range() function doesn’t include this number in the result. The step is a difference between each number in the result. The default value of step is 1 if not specified. Let see all the possible scenarios now. Below is the three variant of range() function. Only stop argument is passed to range() function. So by default, it takes start = 0 and step = 1. Only two arguments (the start and stop) are passed to the range function. So by default, it took step argument value as 1. All the three arguments are specified. i.e. start = 1, stop = 10, step = 2. Note:- In the above program step value is 2 so the difference between each number is 2.
range() function only works with the integers i.e., whole numbers. All argument must be integers. You can not pass a string or float number or any other type in a start, stop and step argument of a range(). All three arguments can be positive or negative. The step value must not be zero. If a step is zero python raises a ValueError exception. As you know for loop executes a block of code or statement repeatedly for the fixed number of times. Using for loop we can iterate over a sequence of numbers produced by the range() function. Let see this with an example. Suppose we have a list of 5 numbers and you want to display each element by doubling it let see how to do it using a for loop and range() function. Here using a len(list), we got total elements of a list so we can iterate for loop fixed number of time. In each iteration using a range() function loop gets the index of the current element. Note: variable i is not getting the value 0, 1, 2, 3, 4 at the same time. i get value sequentially. i.e., in the first iteration i= 0. in the second iteration i become 1 and so on. I have created a program using for loop and range() function to print various numeric patterns to understand the use of for loop and range function. The range(n) is of exclusive nature that is why it doesn’t include the last number in the output. i.e., The given end point is never part of the generated result. For example, range(0, 5) = [0,1,2,3,4]. I.e. it generates integers from 0 to up to 5 but doesn’t include 5. If you want to include the last number in the output i.e., If you want an inclusive range then pass stop argument value as stop+step. Inclusive range() example in Python. A step is an optional argument in the range function. The step is a difference between each number in the sequence. The default size of a step is 1 if not specified. If the step size is 2, then the difference between each number is 2. We can perform lots of operations by effectively using step argument such as reversing a sequence, printing negative ranges. We can use negative values in all the arguments of range() function i.e., start, stop and step. Let us see how. we set, start = -2stop = -10, step = -2.
in the 1st iteration of for loop  = [-2]. Here in this example, we can learn how to use step argument to display a range of numbers from negative to positive. Here in this example, we can learn how to use step argument effectively to display numbers from positive to negative. Python 3’s range uses the generator. Python 3’s range() will produce value when for loop iteration asked for it. i.e., it The range() doesn’t produce all numbers at once. Python range() function returns an immutable sequence object of integers, so its possible to convert range() output to python list. Use list class to convert range output to list. Let’s understand this with the following example. Python range() function doesn’t support the float numbers. i.e., we cannot use floating-point or non-integer number in any of its argument. we can use only integer numbers. However, we can create a custom range function where we can use float numbers like 0.1 or 1.6 in any of its argument. I have demonstrated this in the below example. Also, see other ways to use float numbers in range() function. If you want to print sequence of numbers within range by descending order or reverse order then its possible, there are two ways to do this. First is to use a negative or down step value. i.e., set the third argument of a range() to -1. For example, if you want to display a number sequence like [5,4,3,2,1]. Use negative step value. The following code shows the same. Alternatively, use the reversed function. The reversed function used to reverse a list of any type. To use the reversed function you need to convert a range output to list first. Let see this with an example. range() function works differently between Python 3 and Python 2. The difference between range() and xrange() functions becomes relevant only when you are using python 2. Because in Python 3 xrange() is renamed to range() and original range() function was deprecated. Both the range() and xrange() function generates the sequence of numbers. but range()produce a list, and xrange()produces an xrange object i.e. a sequence object of type xrange. range() generates all numbers at once. Should we always favor range() over xrange()? If you are using python 2.x then yes. as you know in python 2.x range() function loads all the numbers in the main memory before iterating them by for loop this leads to high memory usage and increased execution speed. xrange() and range() which is more efficient. Is there a way print range of characters or alphabets? For example like this. Note: Above code is a pseudo-code. Yes, It’s possible using the custom generator. let’s see the example. in the following example, I have demonstrated how to generate ‘a’ to ‘z’ alphabet using the custom range() function. this is inclusive, means it also includes the last character. Here we used a ASCII value range and then convert an ASCII value to a letter using a Chr() function. Generates the characters from `a` to `z`, inclusive. How does the Python range() function work? 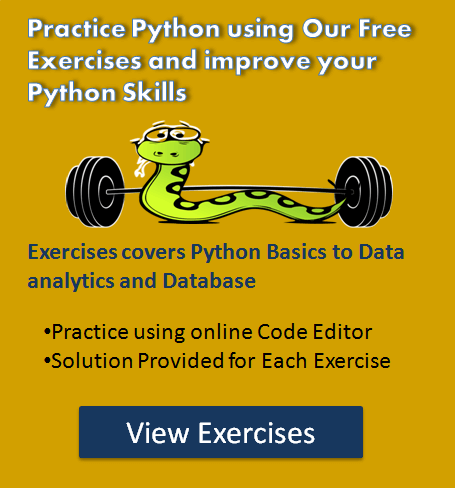 Python range() return value is determined by formula and some value constraints. Note: If a step is a non-zero, Python range() function checks the value constraint. range() returns an Empty sequence If it doesn’t meet the value constraint. 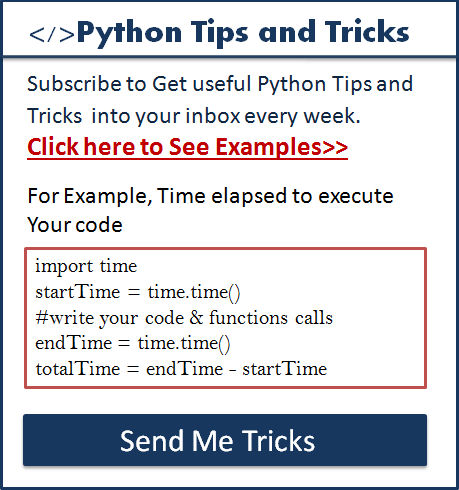 So you must be thinking why does python range(start, end) not include end ? it has a very simple answer because index always starts with ZERO in python. if you count total numbers between range (5) you will get [0,1,2,3,4] i.e. total count is 5. Let say you want to add range(5) + range(10,15). (Note: this code is a pseudo-code.) And you want the concatenated range like [0, 1, 2, 3, 4, 10, 11, 12, 13, 14]. Can we concatenate the output of two range functions? Yes, this is possible using itertools. using chain() function of itertools we can do this. Program: Concatenating two range function results. range() is constructor returns a range object which is nothing but a sequence of numbers, this range object can also be accessed by its index using slice notation. It supports both positive and negative indices. below example explains the same. 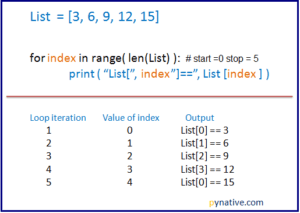 you can also convert python range() output to list and access this list with its index like this. 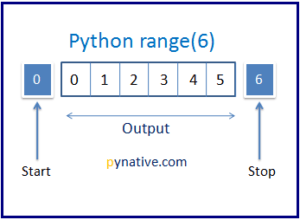 Thanks for your informative article on Python range .As you have described it beautifuuly and easily. The same for the concatenation example that looks like it is valid code. 9) the last example for sample_list gives me the same traceback report as (6) above. 6) The reversed list example fails as follows: Philip it is working as expected I rechecked it. 8) It is typing mistake I was fetching the sixth element. updated the example. Hey, Anon Thank you. I have added comma. This is very good content you share on this blog. it’s very informative and provide me future related information.